If you are visiting our website you are probably experiencing some sort of problem with your vehicle, or are in need of an MOT test, service or repairs. Rest assured, you have come to the right place! We are your local garage and DVSA Authorised MOT Test Centre for Boreham, Chelmsford and the surrounding areas of Essex. As a local family-run garage we live and work locally, so you’ll receive a warm welcome and a service that goes the extra mile, simply because we genuinely care about our customers and the community we have served for over 20 years. Furthermore, as an accredited Bosch Service Centre you can rest assured that your vehicle is in safe hands with our highly skilled team of auto technicians. SLP Autos are able to offer a complete range of servicing, repairs and garage services for cars, motorcycles and light commercial vehicles. We recommend booking your MOT test in advance as we are usually busy and an average MOT test takes around 45 minutes to complete. Customers are welcome to relax in our reception area while they wait. We offer a choice of service options to suit your requirements, including health checks and manufacturer recommended interim, annual and full services. Not sure what service you need? – Our customer service team will be able to advise you by using our Autodata system which provides guidelines for the service intervals on all makes, models. Why not give us a call, so we can advise you what kind of service you need? Are you having problems with your car? – Do you have warning lights showing on the dashboard or has the engine gone into ‘safe mode’ restricting power? – Why not let us take a look? 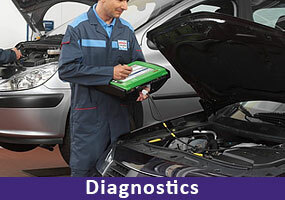 With skilled auto technicians and Bosch diagnostic tools on hand we can diagnose all types of mechanical and electrical faults, warnings and error codes on most makes and models of cars and light commercial vehicles. Our skilled auto technicians are here to help with repairs or to fit genuine, high quality after-market replacement parts including brakes, exhaust and clutch systems, engine components for most makes and models of cars, motorcycles and light commercial vehicles. 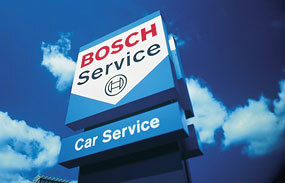 Our parts and services are guaranteed through the Bosch Service Centre network. Customers typically find our replacement parts, fitting and repairs more affordable than local main dealerships. We offer tyre replacement and repair services with a choice of tyres from leading manufacturers including Michelin, Pirelli, Continental, Good Year, Bridgestone and Dunlop for most makes and models. We can also offer wheel balancing and four wheel alignment to minimise tyre wear and improve safety and performance. Customers are advised to book in advance where possible – just so we can make sure your tyres are in stock. Is the steering on your car pulling to one side, or the steering wheel crooked whilst driving straight? Are your tyres wearing unevenly? – These are common symptoms that your wheel alignment is out. It may be that you’ve hit a pot hole in the road, or just regular bumps in the road have knocked the alignment out. We have the latest four wheel alignment equipment to realign your wheels, ensuring your vehicle both handles safely and is more economical on fuel and tyres. At SLP Autos we pride ourselves on our exceptional standard of service and the specialist skills and knowledge of our team of mechanics and auto technicians. With over 18 years’ experience in servicing and repairing most makes and models of vehicles, and a commitment to on-going training, our customers use SLP’s garage services with complete confidence. We have built a reputation based on providing honest, reliable and trustworthy garage services that make it simple and easy for our clients to service and maintain their vehicles. As a Bosch Service Centre we are part of a network of approved garages service with highly skilled auto technicians to service and repair your vehicle with quality replacement parts, and are backed by a complimentary National Guarantee policy for all customers. We supply and fit genuine, or good quality after-market replacement parts, all of which come with a 12,000 mile /12 month warranty. 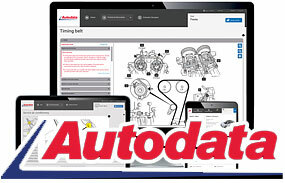 At SLP Autos we use Autodata to quote prices for servicing and repairs. Autodata provides us with technical information for over 16,000 models of cars, light commercials and trucks. This system ensures that we have access to the most accurate, relevant and up-to-date manufacturers’ information on servicing, repairs and diagnostic works and the expected time to complete them. From this information we can then price work on your vehicle accurately, based on the cost of parts and labour. Drive-in or contact us to arrange a free assessment of your vehicle. With expert technicians on hand our service team will be happy to help you with a quick free assessment of your vehicle. If your vehicle requires diagnostics or extensive checks, we will advise you of the cost for these. We cater for private owners as well as commercial fleet vehicles and offer a while you wait service for general repairs and replacement parts. Alternatively you can book an appointment for your vehicle. Whilst we aim to get your vehicle back on the road as quickly and conveniently as possible, we can provide a courtesy car service, if extensive repairs are necessary. If you are running a fleet of company vehicles, maintaining and servicing then to keep them on the road can be a task in itself! At SLP Autos we are able to offer local businesses a fleet maintenance service to take care of all aspects of the servicing and repairs of your company vehicles. Our fleet service is designed to make your life easier, allowing you to focus on what you do best, whilst we help keep your business on the move. Please speak to our customer service team for more information on our range of services which includes courtesy vehicles whilst yours are in the workshop.